The Life Insurance Individual Risk Market (Retail) is going through some major changes. 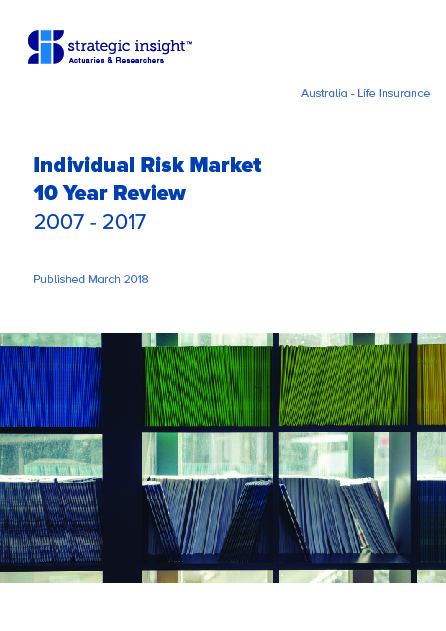 Strategic Insight has reviewed how the Australian Life Insurance market has evolved and developed over the past 10 years, as well as where it's headed over the next 10 years. We have considered the latest market conditions and show the impact on market share of impending company takeovers to occur during 2018. In fact, the six largest Life Insurers in the Individual Risk market will expand from holding just over 74% of Inforce Premiums, to hold almost 88% of the market. There are clear trends to be seen when analysing Inforce Premium market growth rates, with long-term compound annual growth rates (CAGR) falling from 8.6% over the past 10 years to 6.2% over 5 years and annual growth over the past year only 3.4%. Click here to purchase the full report.